In 3 Nephi 12–14, Jesus gave the discourse known as the Sermon at the Temple. However, as 3 Nephi continues forward, it becomes apparent that words and phrases from the sermon are scattered throughout the rest of the text. One might wonder, at first, why these teachings and concepts are repeated throughout 3 Nephi. John W. Welch has argued that the sermon is not quoted at random, but that the subsequent chapters in 3 Nephi were carefully crafted as a way to shed light on the Sermon itself. For example, in 3 Nephi 16, Christ taught, “Blessed are the Gentiles, because of their belief” but warned, “wo, saith the Father, unto the unbelieving Gentiles” (3 Nephi 16:6, 8). He then stated that “if the Gentiles will repent and return [unto the Father], they shall be numbered among [the people of the house of Israel],” who shall not be allowed to “tread” the Gentiles down (vv. 13–14). However, if the Gentiles reject the covenant, the house of Israel “shall tread them down, and they shall be as salt that hath lost its savor, which is thenceforth good for nothing but to be cast out, and to be trodden under foot of my people, O house of Israel” (v. 15). According to an ancient literary practice called Seidel’s Law, a practice related to chiasmus, elements in ancient texts were often repeated in reverse order as a way of demonstrating that the author was quoting from something else. This is a textbook example of that style, showing that 3 Nephi consciously uses and explains the Sermon at the Temple. The appearance of the Sermon at the Temple so often in 3 Nephi is a witness of its importance. 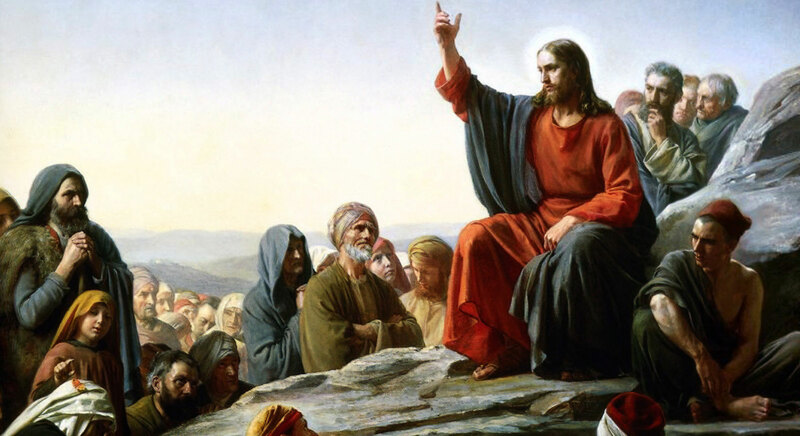 It was not just an interesting sermon Jesus gave before moving on to more important things; it was the core of his message. Far from being a sign of clumsy redundancy, these repetitions invite readers to connect and apply the Sermon more carefully and deliberately. But it is also an invitation to read all of 3 Nephi more carefully, allowing the words of Jesus in that book to explain the Sermon, in greater fullness, so that all readers may come to understand Jesus’s “Sermon of sermons” in all its purpose and power. John​ W. Welch, “Echoes from the Sermon on the Mount,” in The Sermon on the Mount in Latter-day Scripture, ed. Gaye Strathearn, Thomas A. Wayment, and Daniel L. Belnap (Provo, UT: Religious Studies Center, Brigham Young University; Salt Lake City: Deseret Book, 2010), 314 –315; reprinted as “Reusages of the Words of Christ,” Journal of Book of Mormon Studies and Other Restoration Scripture, 22 no. 1 (21013): 63-71. Robert J. Matthews, “Jesus the Savior in 3 Nephi,” in The Book of Mormon: 3 Nephi 8 Through 30, This is My Gospel, ed. Monte S. Nyman and Charles D. Tate, Jr. (Provo, UT: Religious Studies Center, Brigham Young University, 1993), 25–39. In 3 Nephi 15:2–3, for example, the people marveled that “old things had passed away, and that all things had become new.” This was drawn from the Sermon at the Temple in 3 Nephi 12:47: “Old things are done away, and all things have become new.” Jesus then explained to them that “the law is fulfilled” (15:4–5), as he said in 3 Nephi 12:18: “In me [the law] hath all been fulfilled.” He then reaffirmed, “I do not destroy the prophets” (15:6), as well as, “this is the law and the prophets” (15:10). These statements refer to 3 Nephi 12:17 (“I am not come to destroy”) and 3 Nephi 14:12 (“This is the law and the prophets”). He then said to them, “Ye are a light” (15:12), just as he said in 3 Nephi 12:14 (“I give unto you to be the light of this people”). See John​ W. Welch, “Echoes from the Sermon on the Mount,” in The Sermon on the Mount in Latter-day Scripture, ed. Gaye Strathearn, Thomas A. Wayment, and Daniel L. Belnap (Provo, UT: Religious Studies Center, Brigham Young University; Salt Lake City: Deseret Book, 2010), 314 –315. See M. Seidel, Studies in Scripture (Jerusalem: Mosad Harav Kook, 1978). See also Dave Bokovoy, “Inverted Quotations in the Book of Mormon,” Insights: A Window on the Ancient World 20, no. 10 (October 2000): 2; David E. Bokovoy and John A. Tvedtnes, Testaments: Links Between the Book of Mormon and the Hebrew Bible (Tooele, UT: Heritage Press, 2003), 56–60.